Make your own decorated glass dish with decoupage! 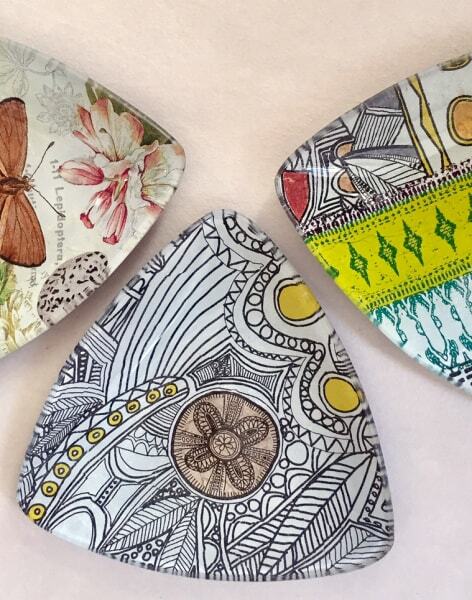 A glass dish can be transformed into something really special using reverse decoupage. 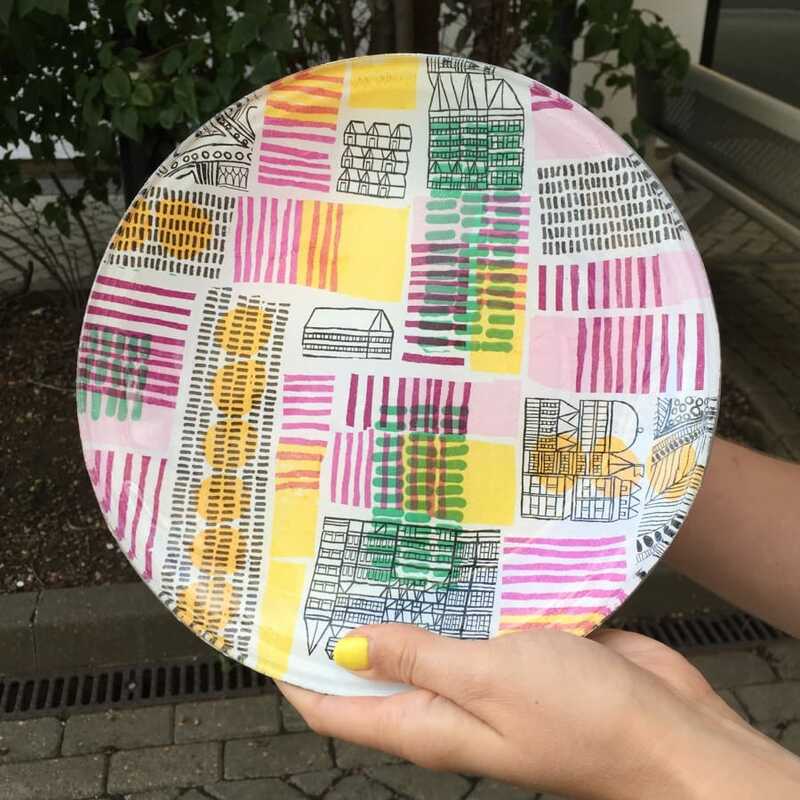 You will learn to apply layers of paper "upside down" and build them into a one-off design: your own work of art on a plate! 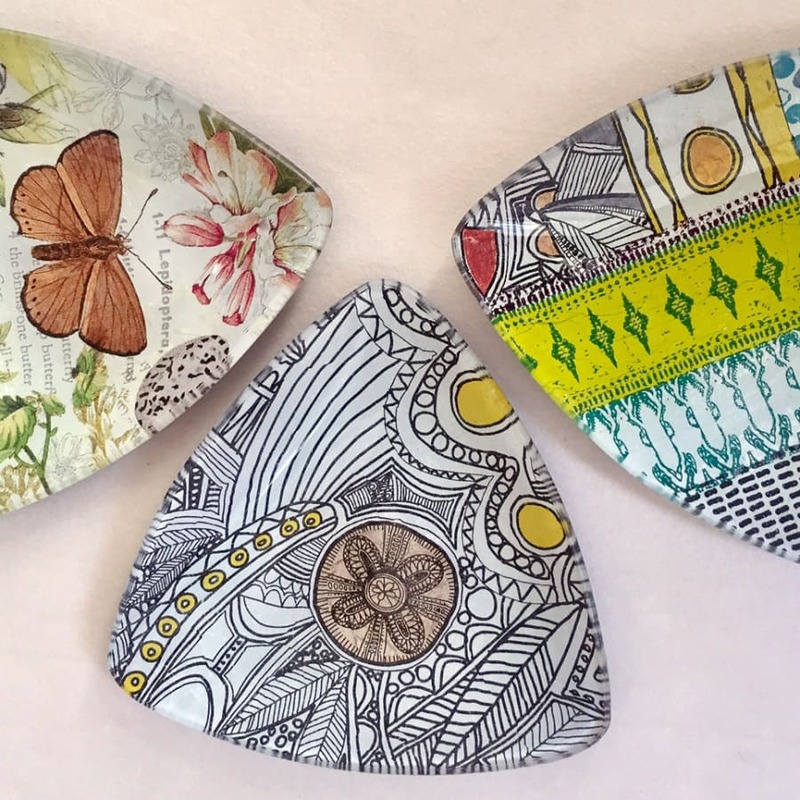 During this 3 1/2 hour workshop, you will select papers from Gabriela's extensive collection to transform a plain glass dish (supplied) into your unique creation through decoupage. Gabriela will guide you through the design process and show you all the tricks involved in applying layers of thin paper to a glass surface. You will be able to use the glass dish for food as we apply the paper to the back and then seal it with a waterproof adhesive. Scroll down to the photo gallery to see the impressive results achieved by previous participants. Influenced by a tradition of cut work that includes the paper cutting of the ancient Chinese, the felt appliqués found among the Siberian peoples, and the Polish folk art of paper cutting, decoupage originated in France in the 17th century as a means of decorating bookcases, cabinets, and other pieces of furniture. Really enjoyed the class with Gabriela - she was lovely and a great teacher, and I found the class both fun and relaxing. Decoupage isn't overly difficult but is super effective, so we all came away with really cool plates and tea lights. It's a skill you could definitely take away and do at home. It was a great class - I made a wonderful glass plate for my mum's Christmas present and she cried! Gabriella had lots of materials, and even printed off some text for me which was very kind. Gabriela was a really great teacher and there was so much choice of designs to use. A great introduction to decoupage, would definitely recommend. Highly recommended. At the top of her field, I’ve admired Gabriela’s colourful, frequently whimsical exquisitely executed work for sometime. So was thrilled when my sister bought me one of her workshops as a gift. The glass decoupage workshop was everything and more than I expected - Gabriela is a great hostess creating a welcoming, relaxed environment to learn and make in. As a teacher she “got inside” my idea, patiently guiding me through the process. Stages and techniques were demonstrated to us as a group but there was also plenty individual attention. Was I delighted with what I made? Absolutely! Thank you Gabriela for your expertise and generosity. I cant wait to give the dish I made back to my sister as part of her birthday. Gabby welcomed us with a cup of tea and biscuits and taught us the art of decopage. None of us had previous experience, but Gabbys instructions were comprehensive and as a teacher she was patient and encouraged our creativity! A great Christmas present for my mum sorted! The class with Gabriela was wonderful. Great workshop. Plenty of attention from Gabriela and everything explained at the right pace. A fun afternoon and I love the plate I ended up with! I was given a voucher as a present and chose this course. I was very pleased with my choice: Gabriela is a patient and inspiring teacher and I learnt a new skill and have a creation to keep. Highly recommended. I really enjoyed my glass decoupage class. The venue was a perfect setting for a fun crafting afternoon. Gabriela paced the class perfectly, particularly as I was a beginner. She was friendly and helpful giving us ideas and lots of materials to work with. I wouldn't hesitate to re-book. The whole experience inspired me to experiment at home! Gabriela was a fantastic host and expert teacher for a friend's hen party afternoon. The studio is beautiful and we had lots of fun being creative and getting to know each other... with plates to take home as mementos of the occasion. Thank you Gabriela! We went for an afternoon of decoupage on glass plates, for our friend's hen do. Gabriela was fantastic and very helpful. She talked us about the process, gave us step-by-step advice and guided us into making pieces we were actually very happy with, had a fantastic selection of materials and enough variety for everyone to be as creative as we could be, with an infectious enthusiasm for the craft. I was inspired and would love to go back and try another of her classes! Gabriela's venue/studio is lovely, a nice courtyard in front with birds in the trees, spacious with kitchen facilities too for the all important tea! The class was a group activity as part of my hen-do (we were very well behaved! ), decoupage onto glass plates. It was fun, simple enough that everyone could take part and come away with something unique and beautiful, and really creative so that we could all flex our artistic muscles. Gabriela was great at teaching the skills needed so that we felt we could go away and make more on our own afterwards. Perfect activity for six, with time for drinks and chatting while we waited for things to dry. We had a really fab afternoon and I wouldn't hesitate to recommend the workshop. I absolutely LOVED this workshop. It's very relaxing and therapeutic. Gabriela was really kind and generous with her comments and feedback and would advise you on even the smallest of details. The studio itself is very cosy and comfortable (with good music in the background) and it was perfect for a rainy London day. You get to finish the plate and take home a ready to use product. Great class! Really great class I was so happy with the finished product, a really great atmosphere to work in too. I look forward to booking another decoupage class with Gabriela in the future. This is one of my favourite classes Gabriela is a great host and teacher I have created some lovely work in her classes and recommend this class. This course is the most original course I’ve ever attended! I went with an old pair of shoes and left with this funky amazing and like-new pair!!! I weat them to work and I still get compliments about them. Gaby is so professional and a great teacher! Also you get to meet awesone people and its a time to unwind and recylce at the same time! Highly recommended!! A friend of mine gave me a workshop with Gabriela as a birthday present and it is one of the best present I have ever received, Gabriela is passionate about sharing her knowledge and helping individuals achieve the effects that they would like too, also Gabriela's studio is lovely and cosy and it makes you feel like at home. Looking forward to enjoying more classes in the future. Thanks Gabriela. This is the fourth course I’ve attended at Gabriela’s art studio . A friendly welcome and a great teacher in a relaxed atmosphere . I was very pleased with the items I have decoupaged and have continued to decoupage at home . Looking forward to next course . Gabriela is an artist and maker. 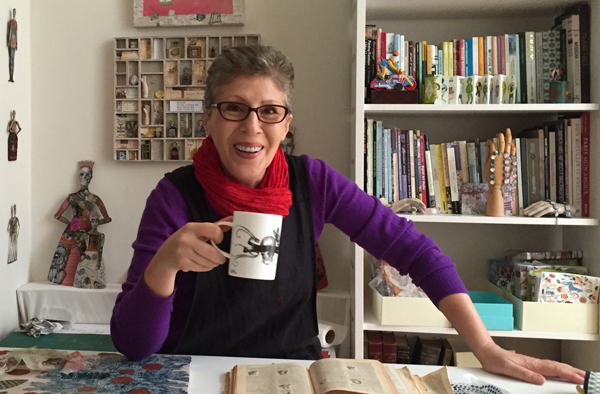 She creates prints and collages, greeting cards, jewellery and scarves with images inspired by memory, nostalgia and a love of everything vintage. Her work is often humorous and whimsical – unless her romantic side takes over and then you enter into a fairy-tale territory of old-fashioned script, pages of books and music scores populated by chivalrous gentlemen, glamorous ladies, butterflies and rabbits. She blends a fusion of painting and digital media – acrylic, watercolour and ink with digital print – onto paper and canvas to create pictures, quirky greetings cards and a range of “art to wear” which so far includes silk scarves and a jewellery collection. Old photograph albums, vintage documents, magazines, books, cards, knitting pattern books and scraps of writing are things that make Gabriela very happy. Second-hand bookshops, junk shops, market stalls, attics and long-forgotten boxes are her treasure trove. 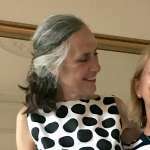 In addition to her own creative pursuits, she is passionate about inspiring other people and sharing her skills, so she devotes a good portion of her time to teaching. Want to get your decoupage fix now? [Click here to read my Obby Project](https://obby.co.uk/blog/obby-projects-upcycle-ikea-stool) on how to upcycle an IKEA stool with decoupage.